The Hampton Nautical Floor Standing Bronzed With Leather Galileo Telescope 62" is by far our standout choice amongst nautical enthusiasts worldwide. Constructed from all Bronze, refractor telescope mounted on a wooden tripod. This telescope is a fully functioning nautical masterpiece that adds class and sophistication to any room it’s in. 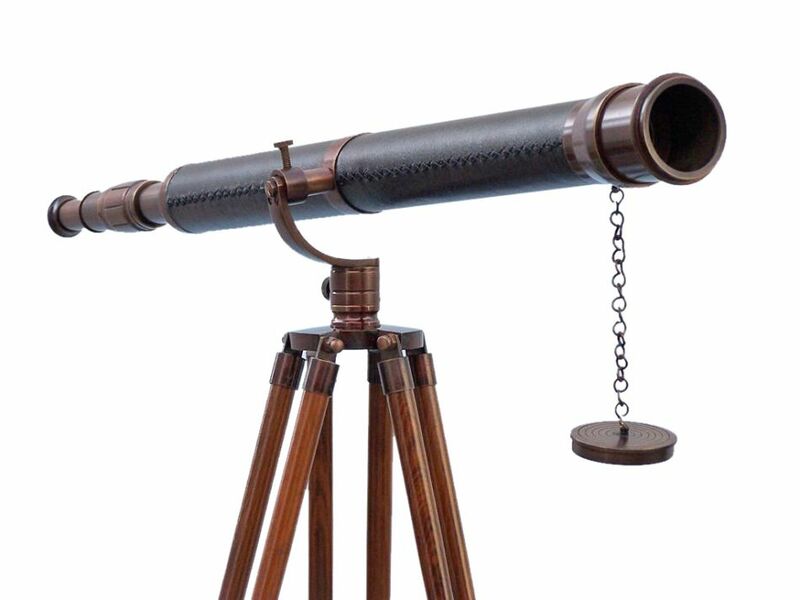 This is a perfect gift for the nautical explorer, an appropriate piece to spruce up an office for the busy executive, or perfectly position this exquisite telescope by your window sill to stargaze. The main scope is bronzed, which shines beautifully when placed in the sunlight. Focusing is accomplished by adjusting the eyepiece ring on the telescope tube, with up to 15x magnification. A removable bronzed cap, connected by a chain, protects the objective lens.